CoolCheck by Kelsius is the market leading paperless temperature monitoring system, automating the process in controlled storage and testing environments within the Healthcare sector. The CoolCheck system complies with industry best practice for the safe storage of medicines & vaccines, blood, lab samples. It will reduce product wastage associated with fridge failure. The broad scope of applications includes fridges, freezers, incubators, water baths, liquid nitrogen tanks, oxygen, C02 amongst others. 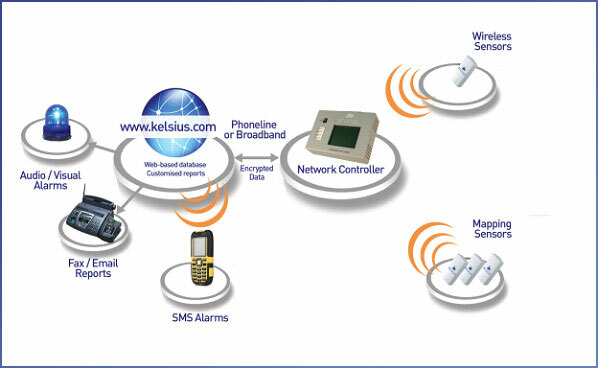 With the Kelsius CoolCheck, automated temperature monitoring system, users are empowered to carry out their own mapping activities, as and when required, in a cost effective manner with little investment of their own time. Traditionally, hospital pharmacies and laboratories have incurred significant costs by employing the services of third party consultants to perform the mapping exercise which typically comes at a large expense. Pre-configured wireless mapping sensors are placed in cold storage areas for a defined period of time, reducing cost and time spent. During the mapping period the CoolCheck sensors will record the temperature data – this data will be instantly available on the Kelsius Web Portal, accessible from any web enabled device. Automatic record of door opening events. "We have increased our confidence in product quality and patient safety. Moreover the system has already paid for itself several times over by helping us avoid significant product loss. We recovered our costs within a year."